Writer Jonathan Lethem made an appearance last night at Wabash College, about 30 miles from Sycamore Review’s office-in-the-attic, er, world headquarters at Purdue University. He spoke at length about how he arrived at his new novel, Chronic City, which hit the shelves last month. He also provided an interesting perspective on his native New York City, as well as an update about the possibility of an Edward Norton-directed film adaptation of his 1999 novel, Motherless Brooklyn. 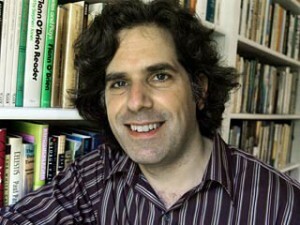 Lethem, 45, grew up in Brooklyn, attended Bennington College in Vermont, and then moved to the Bay Area, where he wrote Gun, with Occasional Music and some of his other early work. Growing up, Lethem was most inspired by Lewis Carroll and science fiction writers such as Ray Bradbury and Isaac Asimov. Those influences helped contribute to the highly conceptual nature of his work, he said. With his return to Brooklyn (he lives four doors from the house where he grew up) and with the writing of Motherless Brooklyn, something “explosive happened,” he said. He began to more overtly explore his hometown, but also to write more directly about his “own deepest loss” — that is, the loss of his mother to cancer when he was 14. “I began to shed so much of the conceptual wizardry in favor of…a passionate tone of confession.” This trend toward the personal continued, he said, with the publication of The Fortress of Solitude and his prolific output of nonfiction in recent years. Chronic City, his ninth novel, follows Chase Insteadman, a former child star who is engaged to an astronaut stuck in the international space station. Into Chase’s life enters pop-critic Perkus Tooth, a conspiracy theorist of sorts, and other Manhattanites, including a self-loathing ghostwriter and a fixer for the mayor. With Chronic City, “I committed totally to intimate, passionate, emotional, confessional storytelling while also subscribing to the conceptual aspect of my early work,” Lethem said last night. He attributed this movement to the realization that his sense of personal loss was not so personal. “The experience of losing a parent wasn’t that uncanny, but it rhymed with sensations of absence already at the heart of my sensibility.” He pointed to the loss of the hippy dream on which he was raised, to the changes in his Brooklyn neighborhood of Boreum Hill, and to his mother’s obsession with the Holocaust and the fragility of the Jewish state. When she died, he said, “I found confirmed in my own family a profound suspicion I already had…[There was] a simultaneity of loss as collective condition and personal [experience].” This combination of the confessional and the conceptual, of personal absence and collective loss, is what makes Chronic City the “best work I’ve done yet,” he said. “Manhattan is another example of a place that is vulnerable,” he said. Especially in a decade book-ended by the Sept. 11 terrorist attacks and the current economic crisis, “It didn’t seem that much of a reach for me,” he said. That might be an apt description for the book, according to some critics. 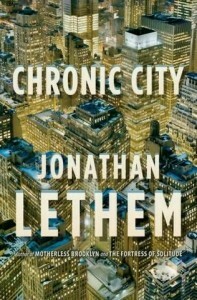 At 480 pages, it’s garnering reviews such as this one from NPR’s Jennifer Reese, titled, Lethem’s Tedious, Maddening ‘Chronic City.’ “Chronic City, is about as broken as a book can be and still merit occasional use of the word ‘brilliant,’” Reese wrote. And what about that film adaptation of Motherless Brooklyn? Lethem sold the film rights to New Line Cinema in 2005. At that time, it was announced that actor Edward Norton would write the screenplay, direct and star in the movie. Four years later, Lethem seemed resigned about the prospects of seeing his book on the big screen. “Because [Norton] wanted to do everything, the project has never gotten off the ground. I don’t see a lot of progress from where I sit…I don’t know if it’s going to come to anything, but I spent the money a long time ago,” he said with a shrug. He also wondered aloud whether Norton is getting too old to play the role of the book’s central character, a pseudo-private detective with Tourette’s Syndrome.